College of Business Graduates standing together at graduation. December graduation took place Dec. 17 at SIU Arena, marking the end to a successful semester for students. Howard A. Peters III, president of HAP, Inc., was the keynote speaker at the ceremony. HAP is a consulting, strategy and advocacy service that assists clients in pursuit of business goals primarily in the areas of criminal justice, human services, and health care. Peters also serves as a criminal justice consultant and expert witness. Saturday was a special day for individuals who walked across the stage to receive the degrees they have worked diligently to earn, and some graduates shared their thoughts about the time they spent in the College of Business over the past few years. 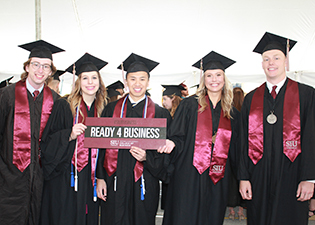 Dylan Meggs, from Gorham, Illinois, graduated with a bachelor’s degree in business administration, and he credited the college for preparing him for his career. Timothy Kincaide, from Chicago, also graduated with a bachelor’s degree in business administration. Nico Marjorczyk, from Dortmund, Germany, graduated with a Master of Business Administration degree and credited the college for preparing him for career success. The three graduates also shared their plans for after graduation. Meggs said he is applying for tech sales jobs in the Austin, Texas, area. The former students also shared some advice for those who are still pursuing their degrees. The College of Business wishes the best of luck to all of those students who are preparing to pursue their dreams. Always remember: Once a Saluki, always a Saluki!